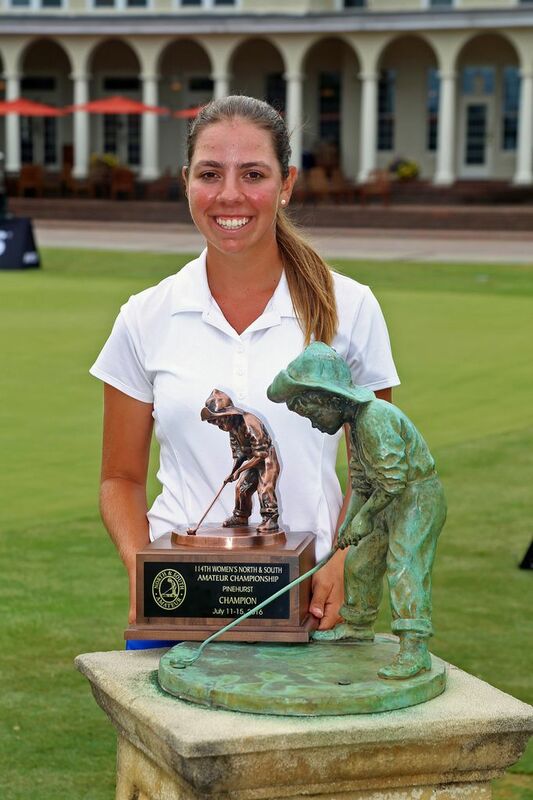 VILLAGE OF PINEHURST, N.C. – Nothing could slow down Kristen Gillman at the Women’s North & South Amateur. Not one of the best college players in the country. Not even lightning and driving rain. Gillman, the 2014 U.S. Women’s Amateur champion, continued her brilliant roll through the 114th playing of Pinehurst’s storied tournament, carding three birdies in seven holes on the back nine to turn away South Carolina All-American Katelyn Dambaugh 3&2 on Friday. How Gillman won the coveted Putter Boy trophy will go down as one of the most dominant performances in the championship’s history, which dates back to 1903. While Gillman was just the ninth seed in match play and won 1-up to survive the Round of 16, she was lights out from there. Gillman won her last three matches 7&6, 6&5 and then was in control of the championship match against Dambaugh, leading 3-up after just 11 holes. Gillman did all of that on famed Pinehurst No. 2, home to more single golf championships than any other site in America. Dambaugh had her opportunities early in match as Gillman’s short game sputtered, and even led 1-up after the 7th hole. But Gillman won the next four holes, winning 8 and 9 with pars before birdies on 10 and 11, the latter of which came on a 25-foot putt after she had missed the fairway for the first time in the match. Just, though, as everything was rolling again for Gillman, in came rolling thunder and clouds. Play was suspended for 2 ½ hours for rain and lightning with the players around the 12th green. But it didn’t faze Gillman, who spent the time scrolling through old photos on her mother’s phone with her sister Emily. The break seemed to reignite Dambaugh, who made terrific par saves from greenside bunkers on 12 and 13 to stay in the match. Dambaugh’s approach at 13 appeared to be perfect but came up just short, burying under the lip. Somehow, though, Dambaugh hacked it out to 18 feet, where she made the putt to grab some momentum. But even that didn’t sway Gillman. And so Gillman stayed aggressive, hitting a beautiful tee shot to about 20 feet on the par-3 15th, where she nearly won the match as her birdie try brushed the side of the cup. On the par-5 16th, playing first from the fairway, Gillman still didn’t shy away from the stage, reaching the green in two with a piercing fairway metal. Dambaugh’s second shot finished just short of the green, and after her chip rolled by, Gillman nearly sank her eagle try, leading Dambaugh to concede the birdie and the match. It was a match that lived up to the stature of the two participants. Both among the highest ranking amateur players in the world, Gillman and Dambaugh combined to hit 22 of 26 fairways and 22 of 32 greens on Donald Ross’ perilous gem. Gillman, in the end, was even par through 16 and both players played the last five holes in 1-under, halving each of them. The Women’s North & South Amateur is the longest consecutively running amateur championship in the United States. North & South champions are among the legends of the game: Babe Zaharias, Louise Suggs, Peggy Kirk Bell, Hollis Stacey as well as Brandie Burton, Brittany Lang, Morgan Pressel and Yani Tseng. As much as the North & South is a championship with a great past, it also continues to foster a great legacy. Ten of the last 13 Amateur champions have joined the LPGA Tour, three of whom have won major championships – Pressel, Tseng and as of Sunday, Lang, who won the 2016 U.S. Women’s Open.